Once upon a time I visited the beautiful city of Budapest. That was a very long time ago, but reading Adelina’s Expat Story about living there is making me what to plan a trip there soon! My name is Adelina and I am from Vancouver, Canada. I am a storyteller and a curious globetrotter. I enjoy writing and taking photos and am a self-proclaimed geek. When I am not out exploring the world, you can find me experimenting with food in the kitchen, participating in pub quizzes or reading. I was an expat in Budapest, Hungary for 19 months. Now, I split my time between Vancouver and Budapest. 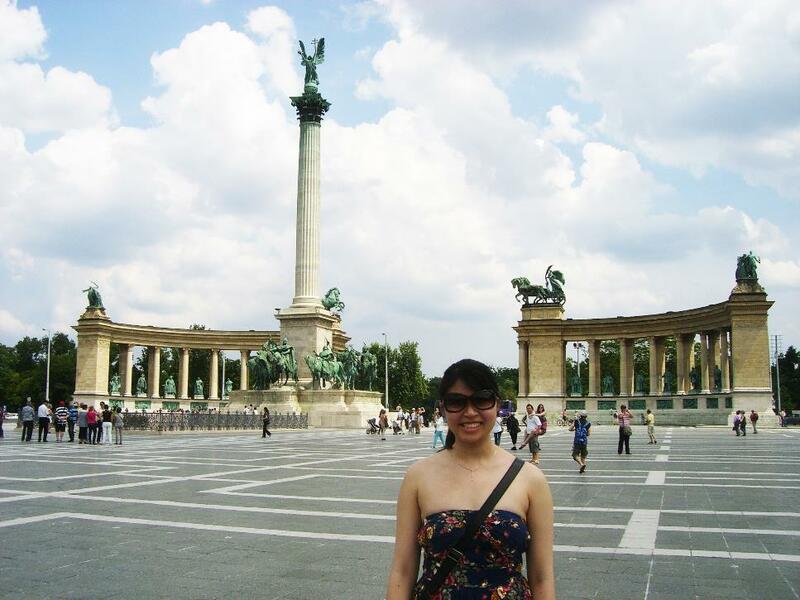 I originally went to Budapest for a job I found through an internship program called AIESEC at my university. While in Budapest, I worked for an English school, teaching occasionally, but mostly working in the office making sure things run smoothly. Now I work in online marketing and am hoping to make the jump into freelancing soon! What surprised you about living abroad? Living abroad is full of highs and lows. For every problem that you encounter, you have to be creative on how to solve it. That in itself is part of the fun of living abroad and it constantly surprising to see how resourceful you can be and how you can overcome difficulties when pushed. My first week in Budapest, I was shocked when there was no toilet paper in the restroom of the bar I was at. Lesson learned quickly and I started carrying my own. I also wasn’t prepared for how expensive things actually would be in Hungary. I thought that having a lower standard of living compared to Canada, things would be significantly more affordable, but it wasn’t necessarily the case. Most consumer goods were just as, if not more expensive as in Canada, which if you’re earning a typical Hungarian wage, gives you less purchasing power. Understanding how much the Hungarian currency, the Forint, is worth was also really difficult. What new tradition or habit do you want to take away Hungary? There are so many things that I think are really cool about living in Hungary, the biggest thing is how Hungarians greet and say goodbye to one another – with two air kisses, one on each cheek. Although I found it strange at first, I really like no as it takes the question out of how to greet someone. In North America, if you’ve met someone once or twice, how do you say hello? Normally with an awkward wave, or maybe an awkward handshake. If you know the person better, then maybe a hug is okay. But in Hungary, there is no question. Once you’ve met and chatted a bit, then it is perfectly fine to say goodbye with two kisses. If you’re seeing an old friend, the two kisses are just as appropriate. If a friend came to visit you in Budapest for one day, what would you take them to see? A walk along the Danube River – Budapest has the great fortune of being building on the banks of the Danube River which splits the city into Buda (to the west) and Pest (to the east). No matter which side of the river you’re on, you’re bound to get a great view of the city. We’d start on the Buda side of the city, walking over the famous Chain bridge to Pest and along the Danube towards the Parliament building. Szechenyi Bath – After all that walking, there is nothing better than a good soak in some thermal water. Luckily, Budapest is built on top of lots of it, giving you plenty of options. Szechenyi is my favorite because the building it is housed in is so gorgeous. Nothing is more relaxing than soaking in a pool of hot water surrounded by such beautiful architecture. Ruin pubs – To end the day we’d go to check out a ruin pub in the city’s 7th district. Ruin pubs are essentially old apartment buildings that have been turned into bars. They’re generally very quirky, with each having unique decorations that you’re sure to not find anywhere else in the world. The best way to end a day in Budapest. What advice would you give to someone who is hoping to live abroad one day? Just do it – There is no right or convenient time to decide to pack up your bags and go. If you really want to do it, you will find a way to make it happen. There are lots of expats all over the world, so if they can do it, why not you? If you want to make it happen, start planning now. Say yes & go with the flow – Living abroad is such a big adventure! Say yes to different opportunities to try and experience new things. Go with the flow of things if they don’t work out the way that you think it would. Don’t stress out too much about the things that you can’t control. It’s okay to be sad or frustrated – It’s a part of the experience. But don’t dwell on it too much. Have a couple hours or a day to feel sorry for yourself, but try to move on quickly after. There are bound to be ups and downs, that’s the nature of living abroad, but it’s how you handle it that matters. Invest in relationships – The people you meet are the most important. They’re your support network and your family away from home. But don’t forget about your friends at home and your family. A Skype call here and there will go a long way. Make time to invest in your relationships from all parts of your life. Have fun and enjoy to the fullest! – You’ll wake up one morning, walk down the street of your new home and look up to take it all in. All in that moment, everything will be worth it. You made it happen. Enjoy the little moments of discovery and have fun exploring a new culture. Thank you so much Adelina for sharing your Expat Story with us! I’m ready to visit Budapest and (especially) to hit the baths! Hello, perfect cure for the cold weather! You can follow Adelina’s adventures on her blog or on her website for travel in Hungary. Plus you can connect with her on Twitter, Facebook and Instagram. Did you enjoy this post? Check out more Expat Stories, or consider subscribing to the Chino House!